Discussion in 'Article Discussion' started by Sifter3000, 13 Aug 2010. All in all this card is actually well disappointing but damn does that heatsink look cool. I read on another forum that the 6000 series is due to launch in November, with price cuts across the 5000 range shortly, so now is probably not the best time to be picking up a card? Maybe the 460 in the sub Â£200 range, but then if the 5850 drops to the same sort of price or lower in the next few weeks... The end of the year could be a good time for GPU purchasing. Meh, the cool and silent Sapphire VaporX is 375euros, the 2GB variant is 400euros. This one (isnt available in Germany) is in between those two. So it's not very attractive. And yes, as stated in the intro, it's the dissappointing Fermi's that are keeping the prices up. I read on another forum that the 6000 series is due to launch in November, with price cuts across the 5000 range shortly, so now is probably not the best time to be picking up a card? This would be nice, let's hope the 6000 series keeps up the comparative performance levels of the 5000 series. A sub 300 EUR 5870 would be nice, as I really can't justify the purchase at present prices since my GTX 275 isn't holding anything back tbh. Shame on the Asus' card though. I can't see why they even bother to bring out a card like that. I understood this PCB was just the V2 design (which other board partners will also be/are using), so waterblocks etc are all available for it? Sorry, it was meant as a "shorter custom PCB." I mention the annoying waterblock incompatibility on the first page of the review. And I think there's a word missing before adjust - able perhaps? You won't see that when its upside down in your case tho. 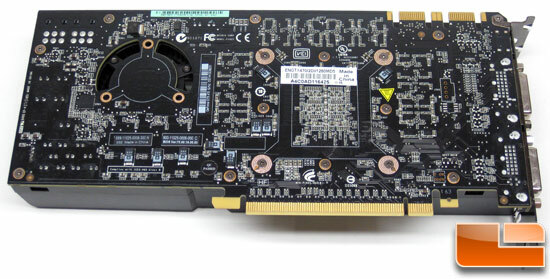 The side of graphics cards you can actually see always look boring. They should but a snazzy LED lit top on them but it'd probably affect temps. Nice selection of games tested, nice write-up, nice review bit-tech! @frontline - The latest rumours are an october announcement followed by a november release. My spidey-senses tell me to expect a small nudge in performance with much higher ddr5 speeds. If it will have the uncore of a future 28nm part as rumoured than it should be able to handle much higher memory speeds. The fastest ddr5 modules are rated for 1500mhz I believe so I reckon around 1475mhz on the 6000 series will be likely. Nope your wrong there, I use a reverse ATX standard where the CPU is at the bottom and the cards at the top, effectively flipping the board upside down so yes I can see the heatsinks but I water cool anyways, also use a test bench where the cards are visible. As for custom PCB, ASUS did that with the 4870 Dark Knight series but I was able to cut and modify EK full coverage blocks to work with it so Im sure any configuration they come up with you could still cool it using a stand a long GPU block and then air cooling the ram. No I was talking about the 4870 Dark Night. card not this card thats been reviewed. Any new news on ATi HD 6000? This Asus 5870 is no better than a reference card. Yea, standalone block is (almost) allways an option, I was referring to fullcover cheesecake. EK does make a dedicated block for this card, though I can't really see the point for getting non-reference cooling solution and replace it waterblock, unless the card in question is cheaper, which, to my knowledge, this isn't.